This is a stunning guilty pleasure. Not only it tastes as good as classic fondue. It also is three times easier to make. You unwrap a wheel of camembert cheese and stick it into the oven. Once you take it out all you need to do is deep your slice of baguette in. But if you are feeling more sophisticated than that, you add some sweet and sour jam, some thyme or rosemary and the whole thing gets romantic. Camembert is cow's milk cheese from Normandy. I'm not sure whether the idea of baked camembert comes from France, though sometimes the dish is named fondue Normand. The cheese is shaped as wheel of 125 or 250 g. It is creamy inside and has edible white rind. Once you bake it, the interior melts and gets gooey. It is important not to overbake it. The best temperature is 180C and the time it needs is around 15 - 20 minutes. After that it starts firming up again and there seems to be no way back once this happens. If your camembert came in a wooden box the best is to use the box for baking. You should take the cheese out, unwrap it, line the box with baking paper and put the cheese back. If it came without a box, you can bake it in foil instead. The foil should cover the bottom and the sides of the wheel. It is good to score the upper crust of the cheese before baking (so that it doesn't burst). If you are in the mood for flavoring you can insert springs of thyme or rosemary or even slices of garlic into the scores. Another option is to brush the upper crust with honey. Overall this savory cheese goes incredibly well with the sweet. But it is even better with something sweet and sour. I absolutely love it with lightly sweetened lingonberry jam. You can get it ready made or make one yourself (takes 10 minutes) from fresh or frozen lingonberries. If lingonberries are hard to find where you live, cranberry or redcurrant will do just as well. If your camembert came in a wooden box the best is to use the box for baking. You should take the cheese out, unwrap it, line the box with baking paper and put the cheese back. If it came without a box, you can bake it in foil instead. Unwrap the cheese and wrap it in foil. The foil should cover the bottom and the sides of the wheel. Score the upper rind and insert springs of thyme into the cuts. Place the cheese on a baking tray and bake 15 - 20 minutes at 180C. Check after 15 minutes. Slightly press the upper rind down. If you feel the cheese is melted inside, take it out. If it is still firm, leave it in the oven for 2 more minutes and check again. While the cheese bakes, brush the baguette slices with olive oil and toast them slightly in the oven or toaster (2-3 minutes should be enough). Once the cheese is ready, take it out of the oven. Cut through the upper rind. 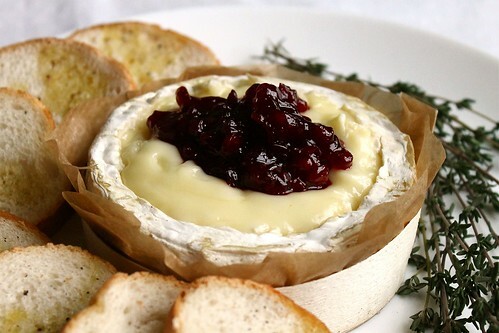 Top with lingonberry jam and serve immediately with toasted baguette. Port, madeira and other sweet wines complement it really well. Combine all ingredients in a small heavy based pan and bring to a boil. Cook on medium heat without lid for 10 minutes. Let cool slightly.